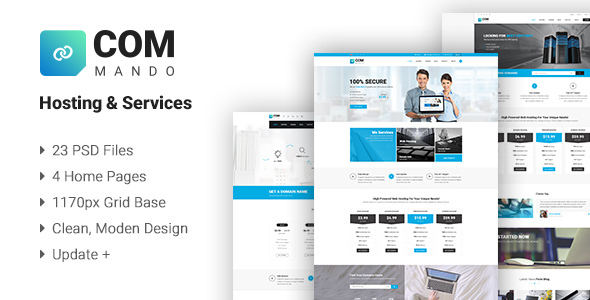 Commando Hosting & Services PSD Templates Created by qtcmedia. This templates have specific characteristics, namely: Commando is a clean, modern, feature-packed Web hosting service that boasts rock-solid uptime, excellent customer service, and flexible website-building tools. The template includes 23 PSD files with properly named and full grouped layers. Especially, commando psd template also provides many . You can use this Commando Hosting & Services PSD Templates on Psd templates category for business, corporate, data center, domains, hosting, marketing, seo, servers, support, vps, web hosting and another uses. Commando is a clean, modern, feature-packed Web hosting service that boasts rock-solid uptime, excellent customer service, and flexible website-building tools. The template includes 23 PSD files with properly named and full grouped layers. Especially, commando psd template also provides many different elements to help you can choose the style so that you can design your website easily. Used attractive Custom Shape icons to bring an unusual look to give a different test to visitors. If you want to buy our PSD, you can leave your feedbacks and if there are any questions or further need supports, please contact us through the email support@qtcmedia.com or via skype: qtcmedia. Don’t forget to rate it. Thank you.